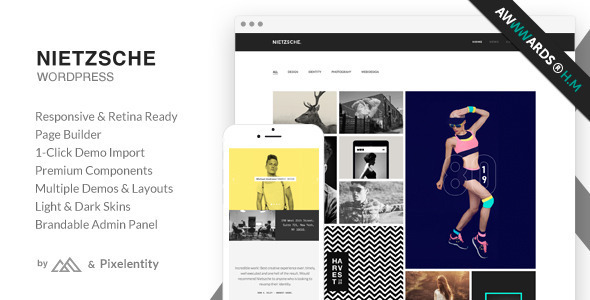 Nietzsche is a robust and flexible theme with a unique design intended for agencies and creative individuals that want to put their work forward in a professional and unique manner. Built on our own flexible framework called Timber, it comes with a range of ready-to-use components, content blocks and several in-house developed plugins and much much more. - Post page with sidebar left/right. Sub Menus Note: The fullscreen overlay menu and the slide-in menu (accessed using the hamburger menu icon in theme header) both support sub menu items, however the secondary menu, that visible always in the header of the theme, does not support sub menu items. - Custom per thumbnail cropping. - Easily change theme primary colors from admin theme options page. - 1-click demo content import. - Localization ready, pot file included. - Comprehensive browser based documentation. - Dedicated Support forum with a proven track record for great after sales support. - Built on a full OOP, modular, load-on-demand, WordPress framework. - Developed with WP_DEBUG and Debogger enabled. All of our base photos come from the following stock photography sites. - WordPress development by bitfade/pixelentity . - Original Design and development by ThemeMountain . - Original HTML version can be found here: Nietzsche HTML . - Preview image/video assets are for demonstration purposes only and are not included in the download package. - Improved menu extensibility support by using native WordPress filters. High Resolution: Yes; Widget Ready: Yes; Compatible Browsers: IE9, IE10, IE11, Firefox, Safari, Opera, Chrome, Edge; Software Version: WordPress 4.6.1, WordPress 4.6, WordPress 4.5.x, WordPress 4.5.2, WordPress 4.5.1, WordPress 4.5, WordPress 4.4.2, WordPress 4.4.1, WordPress 4.4, WordPress 4.3.1, WordPress 4.3, WordPress 4.2, WordPress 4.1, WordPress 4.0; ThemeForest Files Included: PHP Files, CSS Files, JS Files; Columns: 4+; Documentation: Well Documented; Layout: Responsive. Palas - Multipurpose Business WordPress Theme; SmartMvp - Startup Landing Page WordPress Theme; Maven - Responsive Portfolio WordPress Theme; Ernesto - Responsive Multipurpose WordPress Theme; Momentum - Simple Creative One Page Theme; Nestor - Responsive WordPress Theme; Thread - Multi-Purpose One + Multi Page Theme. Keywords: agency, clean, coming soon, contact form, creative, css3, fullscreen, gallery, minimal, modern, parallax, photography, portfolio.